Submitted by sonicdh on August 11, 2014 - 1:33am. I just finished relaying kapton tape on my print bed and re-leveling it (no auto level). Sometimes I think it's intentionally messing with me. Submitted by Fuseblower on August 11, 2014 - 3:04am. I am probably going to regret asking this, and I must be missing something blatantly obvious - but how does inverting the STL file help if your model doesn't have a flat top...? Submitted by humungusus on August 11, 2014 - 3:44am. My guess would be inverting the normals (making the outside of the walls point inside of the walls, as bizzare as it sounds) will make the repair/regenerator software do more magic stuff to repair it and make several sacrifices to the printing gods for the glory of shaped plastic! Submitted by Fuseblower on August 11, 2014 - 12:43pm. So this would be a 'logical' invert, rather than a spatial one? Submitted by humungusus on August 12, 2014 - 1:19am. In a sense yes, it is a logical one, because suddenly, the model would be the whole space EXCEPT for the model (i.e. the complement of the model). If by spatial you meant 'turn it on its head', then that isn't it. Although turning stuff around helps sometimes to get less overhangs and stuff. Submitted by Fuseblower on August 12, 2014 - 2:07am. Got it - that makes sense. Thx! Submitted by Jam on August 12, 2014 - 9:39am. Submitted by humungusus on August 12, 2014 - 3:26pm. welp, I tried it anyway. On one model, it actually got better results than the original... just... what? Submitted by Jam on August 12, 2014 - 4:42pm. Submitted by Fuseblower on August 13, 2014 - 3:38am. Right. That's it. The mill stays! Submitted by humungusus on August 11, 2014 - 3:51am. Oh yes, the hairspray. The fact that such an ordinary thing really makes it stick adds significantly to the feel of witchcraft already happening. Submitted by aj2x on August 11, 2014 - 6:18am. Heheh -- reminds me of decades ago, when CCDs were just being developed, and the ones we got from the fabricator were SO variable. The lore was that you could "passivate" them with clear Krylon spray. Might actually have worked, too, though we still had to tweak all the operating voltages to get a (more-or-less) clear picture every time we powered them up. Submitted by treborg on August 11, 2014 - 10:43am. I'm chuckling about this. I'm on the 3D printing learning curve with a MakerFarm i3v printer. Very relevant comic! BTW, the hairspray needs to be cleaned off and new stuff applied about every four prints. Submitted by fluffy on August 12, 2014 - 8:44am. Oh man, I didn't know about MakerFarm. Looks pretty neat! I'm still happy with my Replicator Dual but I like to keep my eye out for cheaper entry-level printers since a lot of people treat me like some sort of 3D printing expert and always ask my advice (but never want to pay for a MakerBot). From the pictures it looks like those put X/Z on the extruder and Y on the build plate. I've always gotten the impression that it's harder to get high-quality prints that way, due to the inertia of the build and plate (rapid motions shaking the build etc.). Have you had problems with that? Submitted by treborg on August 16, 2014 - 1:10pm. I've had no problems that are due to the Y-axis bed. The latest version of the printer uses aluminum extrusions for motion along each axis. My problem is trying to move geometry from SketchUp to Slic3r to the printer without losing details like thru-holes. Arrrg! Submitted by fluffy on August 12, 2014 - 8:37am. Oh man, so many evenings spent tuning my Makerbot, re-leveling the build plate, coming up with simpler calibration/leveling techniques, all just to print out a stupid knickknack I found online. ETA: Oh, another trick to printing ABS is to wipe down the print bed with acetone to clean off any residue from the previous print. Also, I haven't tried this, but apparently PLA works a lot better if you cover the print bed with blue painter's tape, and disable the build plate heater. I will have to try that someday since so far my success rate with PLA is approximately 0% (although some of the failures look pretty amazing in their own right). Submitted by Fuseblower on August 11, 2014 - 4:14pm. TBH, my total involvement directly with this at present is just to observe how gob-smackingly awful the stuff coming off my bro-in-law's Reprap is. I gather that some people manage better than that, so I guess it's his fault! The stuff we need to make, I'm still quite happy to mill from the solid. Submitted by Ben Hudson on August 15, 2014 - 1:20pm. I have a PEI bed on my Robox 3D printer and I don't have to level it, apply tape, or apply any sort of coating. It just prints. ABS, PET, and nylon all work great. Submitted by HiEv on August 16, 2014 - 2:11am. Ah, yes. The power of intermittent reinforcement and confirmation bias to produce superstitions strikes again! Reminds me of the B. F. Skinner experiment from 1947, where pigeons were given food at totally random intervals. The pigeons developed "superstitions" about what actions they thought triggered the food, and would begin repeating those actions as though it would cause more food to be given. It helps knowing that we humans are just as prone to this kind of error, because, unlike pigeons, _we_ have access to the scientific method, which helps us confirm or deny our suppositions. Submitted by HaHaRich on August 18, 2014 - 3:44pm. 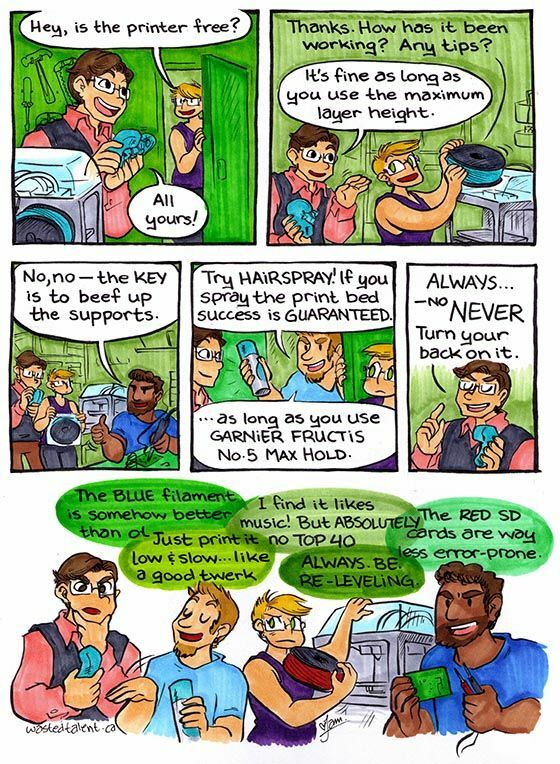 Everyone's got a favourite trick to getting a good print out of a particular machine. Of course these tricks are all very silly. The REAL key is to invert your model and then regenerate the STL file before importing it into the slicer. Obviously.